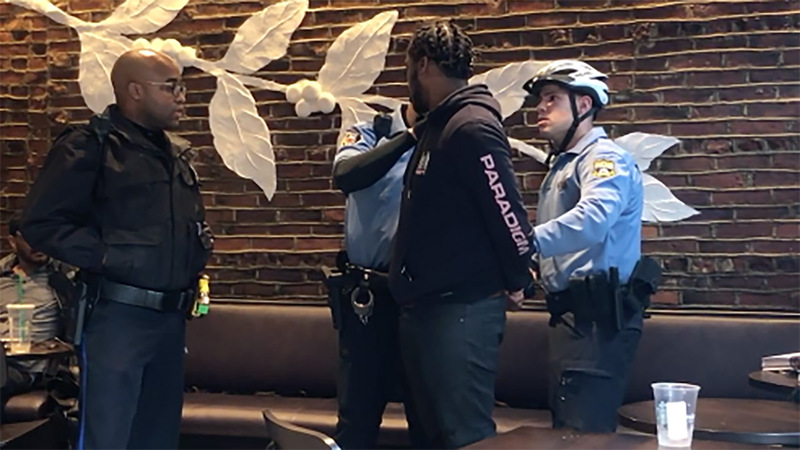 PHILADELPHIA (WTVD) -- Starbucks apologized and confirmed it is looking into an incident that led to the arrest of two men at a Philadelphia location earlier this week. Video of that arrest posted to Twitter now has more than 2 million views and has also prompted an internal investigation within the Philadelphia Police Department. The caption of the video reads: "The police were called because these men hadn't ordered anything. They were waiting for a friend to show up, who did as they were taken out in handcuffs for doing nothing. All the other white ppl are wondering why it's never happened to us when we do the same thing." In the video, you can hear the friend who was meeting them ask officers what's going on. "What did they get called for?" he asked. "Because there are two black guys sitting here meeting me? Tell me, what did they do?" Other customers then chimed in. "They didn't do anything, I saw the entire thing," a person off-camera said. A witness account said the manager escalated the situation by calling police instead of asking the men to buy something or leave. Starbucks responded to the tweet, saying "we're reviewing the incident with our partners, law enforcement and customers to determine what took place and led to this unfortunate result." The witness said the incident began after the men asked to use the bathroom and were told that it was only available for paying customers. Saturday afternoon Philadelphia Police Commissioner Richard Ross delivered a statement, which was streamed live on the department's Facebook page. Ross said the department's internal investigation revealed the officers who responded to the scene acted appropriately, and in accordance with police guidelines. "On three different occasions the officers asked the males to leave, politely," Ross said, "because they were being asked to leave by employees, because they were trespassing. Instead, the males continued to refuse.... They told the officers they were not leaving." At that point the men were arrested. After they arrived at the police station to be processed, Ross said, authorities were informed that Starbucks did not want to press charges against the men, and so they were released. Ross added, "As an African-American male, I am very aware of implicit bias. We are committed to fair and unbiased policing, and anything less than that will not be tolerated in this department." Philadelphia police also tweeted that they are aware of the incident at the location at Spruce and South 18th streets and they are conducting an internal investigation. The DA's office said it declined to pursue charges because of lack of evidence that a crime was committed.